Written by the founder of the field, this practice-oriented guide summarizes the author's breakthrough research results and their applications in chemical technology. The book adopts an entirely novel approach, describing the physical chemistry of structure formation and materials synthesis under dynamic conditions. It begins by developing the general theory in the first two chapters with as little mathematics as necessary and substantiated by experimental results in each case. 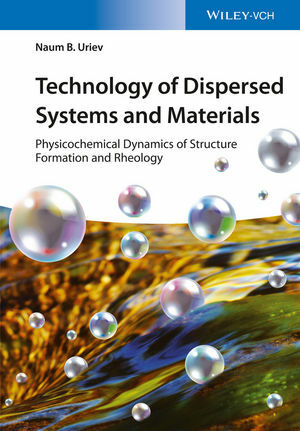 The following chapters deal with the fundamental aspects of rheology, vibrorheology, and superfluidity of structured dispersed systems within the framework of physicochemical dynamics, while the final chapter exemplifies the technological applications of the developed methodology using real-life problems of materials science and chemical engineering. The authoritative guide to physicochemical dynamics. Naum B. Uriev is Head of the Laboratory of High-Concentration Dispersed Systems at the A. N. Frumkin Institute of Physical Chemistry and Electrochemistry of the Russian Academy of Sciences and Professor at the Moscow State Automobile and Road University. He is the creator of the new branch of physical chemistry, namely the physicochemical dynamics of dispersed systems and materials. Professor Uriev is author of more than 450 scientific papers, 15 monographs, 50 inventions and patents in the field of colloid chemistry, physicochemical dynamics and materials science. He is a recipient of the Award of the Council of Ministers of the USSR and of the Rehbinder Award of the Russian Academy of Sciences.